Although this recipe seems to be geared toward Mexican cuisine, I was looking for something to go with an Indian dish, so I decided to use basmati as my rice. The great thing about this recipe is it can be altered in so many ways (hence the basmati), and you can sub out any grain: try brown rice, quinoa, even couscous. 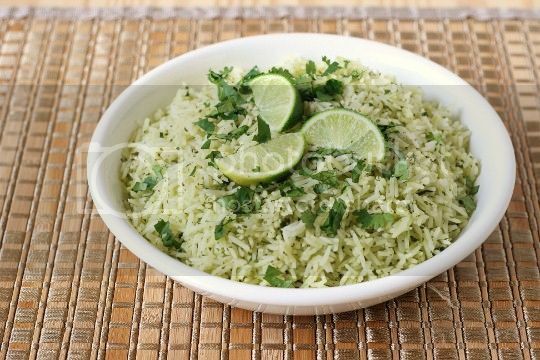 It's very easy to make, as you're simply adding a pureed mixture of cilantro, lime juice, olive oil, and garlic (I didn't add any additional water as the recipe suggests) to hot cooked rice. Made as is, the flavors are disappointingly mild. The rice isn't overly seasoned, so make sure you season it to taste with salt and pepper. 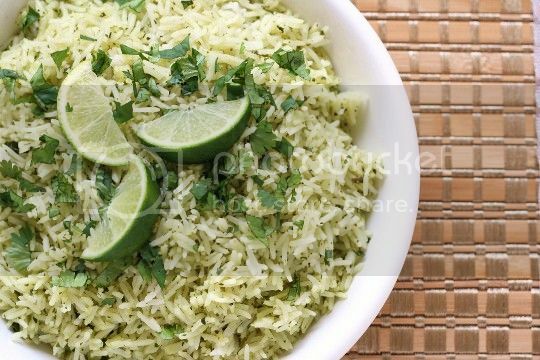 There is a slight hint of tangy lime and citrusy cilantro, but to really make this rice pop, I'd suggest doubling those amounts or even adding some lime zest. 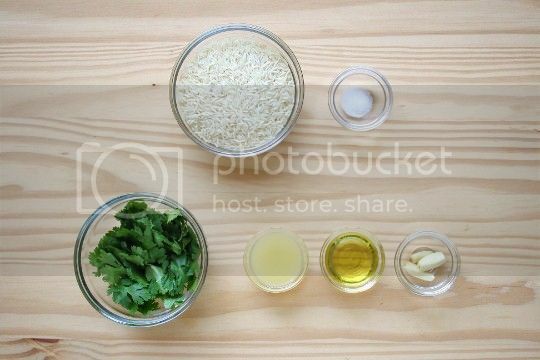 For more flavor, try cooking the rice in vegetable broth instead of water. The rice tastes very similar to the kind served at Chipotle restaurants, and the flavor deepens the longer it sits. While I wouldn't say this was the best rice dish I've ever had, it definitely has potential and lots of room for improvement and adaptations. Make again? Yes. Mas cal y cilantro! I cook the rice with the wedge of lime. I think it makes a difference because the lime oil from the rind cooks into the rice instead of just the juice. What do you think? I think that is a great idea, thanks for the tip! Looks good! I always prepare fried rice and I think to make the flavor pop, you need more than 3 cloves of garlic. Sometimes, depending on how much rice I have, I use about half a garlic and I smash it and mince it. Same with the cilantro. Maybe the step is to not really measure anything when making fried rice. :) Great recipe though, will definitely try it!